Vasil Iljoski was born in Kumanovo, 1902. Vasil Iljoski was writer who stayed engaged in the Macedonian drama for five decades, signifying a new era in the Macedonian literature. Vasil Iljoski was important figure in the Macedonian literature, considering the quantity, as well as the value of his works. 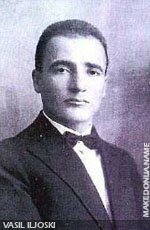 Even though, Vasil Iljoski appeared in the worst period for the Macedonian artists, he succeeded to impose himself, signifying the flowering of a specific literature - the Macedonian drama between the two World Wars. 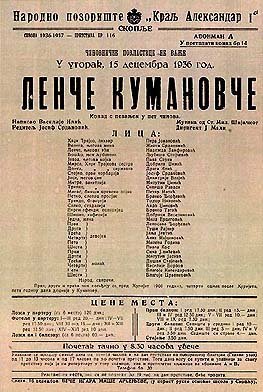 "Lenče Kumanovče Play in Skopje, 1936"
His first play is called "Po Maturata" (After Graduation), followed by: "Lenče Kumanovče (Later known as Begalka - Fugitive); "Uchenickata Avantura" (Student Adventure), "Chest" (Honor), Kuzman Kapidan, "Mladi Sinovi" (Young Sons).